Our staff is working on many projects to help athletes, coaches, athletic trainers, and physical therapists to achieve their goals. Some of them are listed below. We presented the latest Swim Power test, research on swimming technique, training, the E-Coach, the Vertical Swim Trainer, and Vibrotherapy/ Vibrotraining machines for more than 1,200 coaches from all over the world. 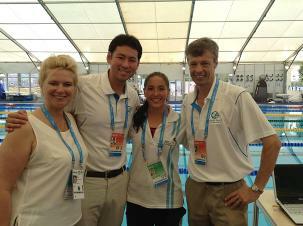 The GST, Inc held a Swimming Coaches Clinic in Lithuania. 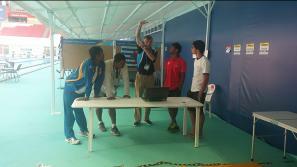 Presentations on swimming technique, swimming drills, dives, and turns have been delivered to 125 coaches. The best Lithuanian swimmers had an opportunity to be tested using the latest Swim Power technology. Based on the testing results, individual recommendations on swimming technique and customized drills have been developed. Our staff attended the 2015 Swimming World Championships in Kazan, Russia to test swimming technique for more than 180 swimmers from 70 countries. Coaches and swimmers had an opportunity to learn about the latest Swim Power test and how to improve their individual swimming technique. Every swimmer received customized drills to fix individual mistakes in swimming technique. Besides testing of swimming technique, our staff conducted Race Analysis to evaluate swimmers splits, tempos, distance per stroke, dives, turns, number of cycles per lap, etc. The GST, Inc staff was invited to participate at the 2014 Youth Swimming Program in conjunction with Swimming World Championships in Doha, Qatar. We tested 230 swimmers from 115 countries. Swimmers and their coaches received valuable information about swimming technique and methods to improve it.